I hope everyone had a happy holiday season and is enjoying the new year! I took a couple weeks off to enjoy family, friends and of course some food! After the busyness if the holidays we had the honor of celebrating Baby O’s first birthday. Let me first warn that having a baby RIGHT AFTER Christmas and New Years is brave. So is throwing a birthday party less than a week later. But Hilda doesn’t miss a party so I put on my thinking cap and got to work. Problem #1: Budget. I’m not spending tons on this party. Let’s be honest its more for us me than it is for her. She won’t remember it and she’ll likely be embarrassed when I display these pictures all over the place on her 16th birthday. Fix: I devised a plan to use paint chips (free!) from Home Depot and a little bit of Pinspiration. I don’t have a fix yet for the 16 year old embarrassment. I’ll get back to you on that. 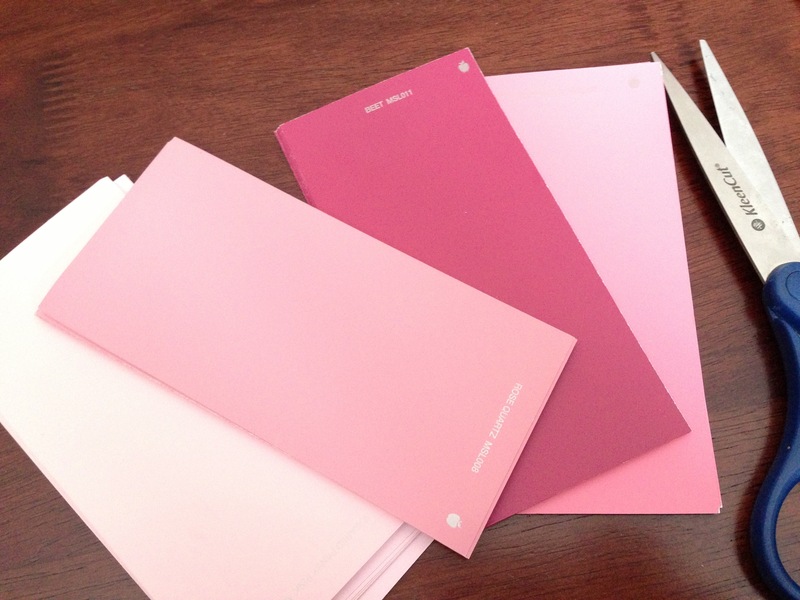 I grabbed several different colors of paint chips from the Martha Stewart line at Home Depot. They are the biggest swatches I saw and had the best selection of pink. I shoved a handful of each shade of pink into my purse (Ok- I didn’t bring my purse in but luckily Molly was on this adventure with me and she carries an equally large purse- Thanks Molls). I know they are free but I felt embarrassed taking so many swatches. Stashing them in the purse was the best idea I had. *Clarification: I spent $60 there that day on air filters and supplies for a little electric project we had going. So I felt like I paid for the swatches anyway… And I buy tons of paint there. I think the Home Depot paint staff might secretly hate all the Pinterest addicts who come in a swipe swatches. 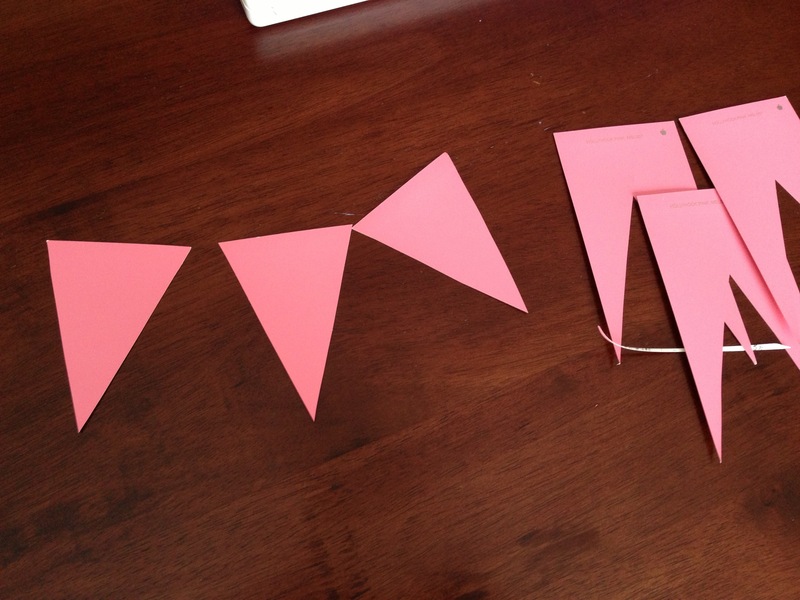 I cut a large triangle out of each of the swatches. I didn’t measure or trace anything. I just cut as big of a triangle as I could get. They varied a little but it doesn’t bother me. I made sure to start the base of the triangle at the end of the swatch that didn’t have any printing or markings. 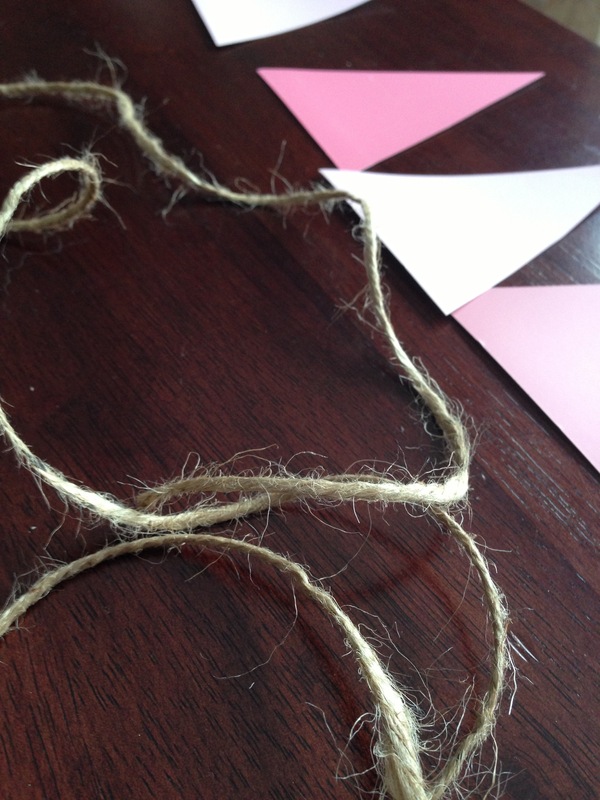 I pulled out my trusty twine and hot glued each triangle about 6 inches apart from each other. I randomly mixed the colors without pattern and just kept gluing. 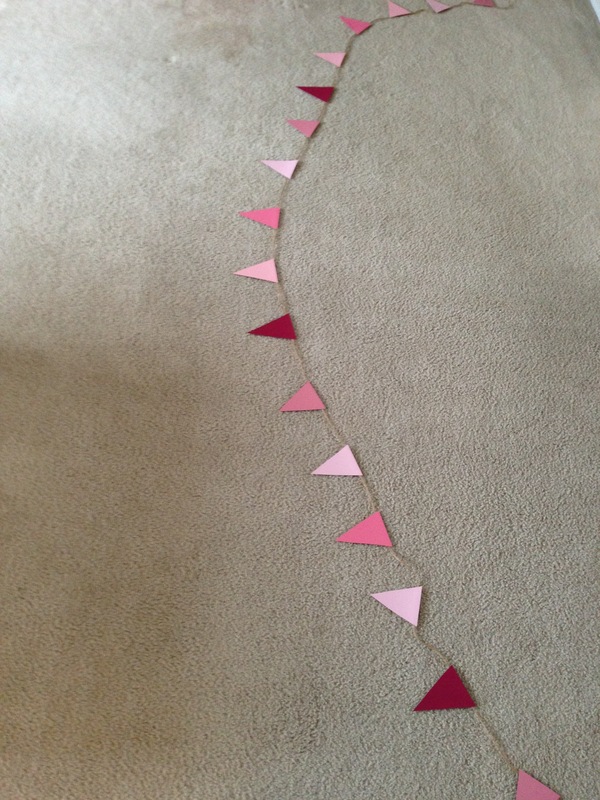 I laid the garland out on the floor to keep tabs on spacing and placement. I also wanted to guestimate how long I needed each strand to be. This was the end result. 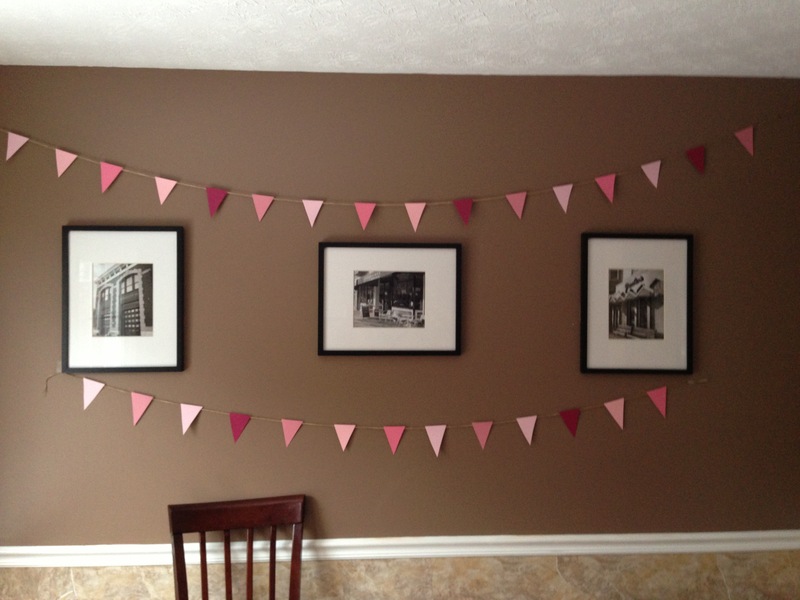 I hung the garland along the dining room wall. I knew I was going to hang tissue paper poms there and that most birthday pictures would have this wall as the back drop. Problem #2: Time. I don’t have enough of it as is. Let’s not talk about the last time I shaved my legs. TMI? Sorry. Fix: Prepackaged decor and a friendly helping hand. I grabbed a 3 pack of tissue poms at the party store for $3.99 and I knew the $4 was about what I’d spend making them and the prepackaged ones saved me a ton of time. They were still tedious and a pain to puff out. I didn’t perfect my puff and fluff technique until halfway through the last pom but it is what it is. I enlisted a friend to bake the smash cake and big cake. That alone saved me HOURS. So big shout-out to Sara for some gorgeous and super tasty cakes! Her cakes were also way more delicious and pretty than anything I could have done. Baby O’s cake was pink with white icing. Word to the wise: colored icing can stain and I’ve seen enough of it regurgitated on first birthdays to order white icing. Also, Baby O has been pooping pink for 2 days. I chose the lesser of the two evils. 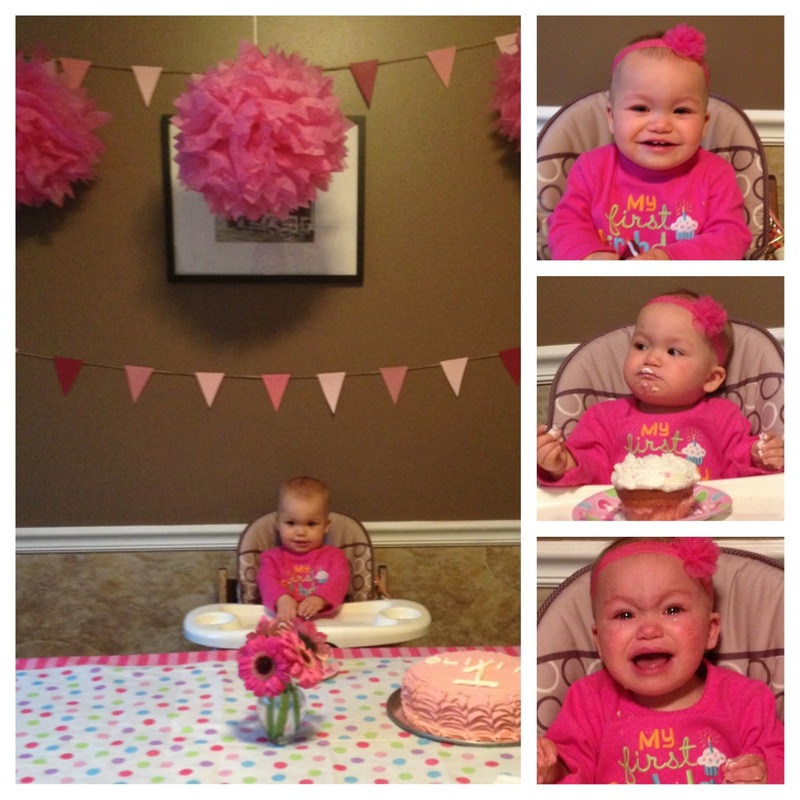 Here is O anxiously awaiting her cake, enjoying her cake and then crying when we took it away to clean up. And then she pooped pink. She really is all girl!